When I was little my Mum introduced me to the phrase “turn over a fresh leaf”. When I first started praying it was with this phrase in mind, “Please God, help me to turn over a fresh leaf” in relation to improving my behaviour - I was quite the liar as a child and sometimes mistreated my little brother (good stories for a future date). Sorry Nigel. Today I started the CSIRO Diet. It’s a 12 week program, much needed after 6 weeks of being quite reliant on take-away food with all our travel and the move. A smoothie for breakfast, an egg sandwich for lunch and salmon with asparagus and snow peas was a great start. I’m not so good with curtailing my wine intake though. That will come. Speaking of wine, it took me two days to organise the wine in the new house and complete the CellarTracker database for it. Apparently there are about a dozen wines that should have been consumed long by now - a great excuse to drink up. The most important fresh start of the day was my Master of Research degree. I have been waived from completing the first year of this degree due to my Master of Education so jump straight into second year, technically commencing 1st of January. I previously attempted this in 2016 as a part-time thing while working at Pymble Ladies’ College. Within a month or so it was obvious I wasn’t going to be able to juggle a demanding job at a new school with completing a thesis. Doing it full-time meant I was also eligible for scholarship consideration, which I was awarded. Yay me! Today I met with my supervisor and now I need to really put some work into it. Last October it took a mammoth effort to put my proposal together which I summarised in four pages instead of the 1-2 requested. I figure this makes up for the first few weeks of this year and that my actual commencement date is now. It was a productive meeting but made me aware of more hurdles (ethics) than I thought there would be. Another reason to push forward. As I went around the university lodging forms, picking up my campus card and seeing the IT Help Desk to fix my email access, I noted that many of the buildings at Macquarie University are going to have a fresh start. The old Hub that housed the bar, food establishments and the student union is currently being knocked down (photo at the top of this post). Other buildings are having all their inner walls removed, leaving empty shells awaiting their fresh start. 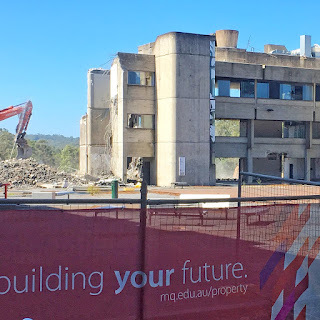 Over the last few years, it has been a delight to observe the transition of the uni out of the 1970s concrete bunker feel I experienced way back during my undergraduate degree. As for the move, despite several boxes remaining unpacked, I think that since this is the day the Internet finally started working for us, I will mark it as the milestone of feeling properly moved-in. Given all the above, it really feels like a new adventure, that the leaf has been turned over, once again.